LOCK LACES™ provide stretch-fit comfort and locked-in safety for all sports and casual use. LOCK LACES™ are a necessity for runners and triathletes improving performance and transition times. LOCK LACES™ are one size fits all. 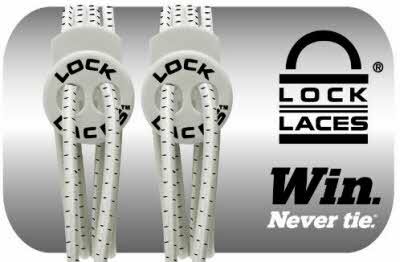 LOCK LACES™ are 48” inches in length. LOCK LACES™ are elastic and stretch to 72” inches in length. 3 Pack Contains: 3 pair of WHITE LOCK LACES™ (each pack contains 2 elastic laces, 2 cord locks, and 2 cord tip to protect laces ends from fraying).